CAFOD is the official catholic aid agency for England and Wales (see www.cafod.org.uk ). It works in over 40 of the poorest countries around the world to tackle issues of poverty and injustice. The work of CAFOD is one of the ways in which the Church expresses its belief and acts out its mission to promote human dignity and social justice. 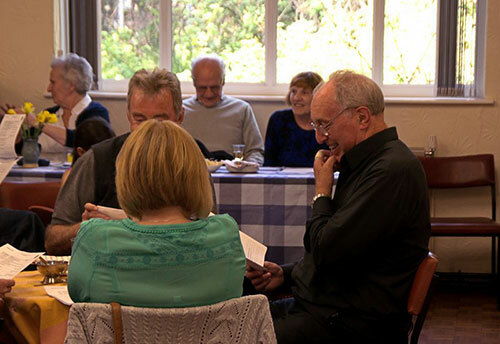 Every two to three months there is a parish-wide CAFOD group meeting. In this group we have been following CAFOD’s latest campaign: “Hungry for Change”. As well as organising lobbying for the G8 meeting in June 2013, this group has also organised a FairTrade wine-tasting evening and manages a FairTrade stall at Kirkstall Festival each July. 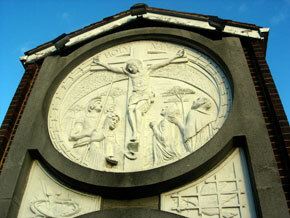 The meeting moves around between the churches – so keep an eye on the bulletin if you are interested. Church of the Assumption CAFOD Group? Our group has been meeting for several years. As well as joining in the whole parish group activities, we have been supporting CAFOD’s “Connect2” programme since January 2012. This programme is helping us journey with the people of Puentecitos in El Salvador in their struggles to develop their community. It also enables us to raise money to help CAFOD’s partners in the region who are working with the people of Puentecitos and similar communities in El Salvador (In the 18 month period from January 2012 the Assumption Community has raised over £4,000). 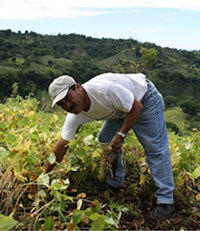 The work of CAFOD’s partners in the area is focused on education and organic farming methods. The group generally meets once a month and welcomes anyone who is interested. Please keep an eye on the bulletin to see when the next meeting will be. The CAFOD group at the Assumption Church in Leeds (part of the parish of Our Lady of Kirkstall) held an Auction of Promises on April 26. We held it on a Sunday afternoon and combined it with Afternoon Tea – for which people paid a modest entry fee. It was something that the group had never done before so we were a bit unsure and had many discussions (too many!) about how to handle different circumstances and aspects of the organisation of the event. Our hopes were that we could make £500 - £800 out of the event to support our Connect2El Salvador link with the communities in the area around Puentecitos. We had a catalogue of 45 promises. They included all sorts of things from many different members of the church community and some people from the other two church communities that form part of the parish. Promises ranged from our church Ceilidh band offering to do a ceilidh for someone’s special occasion, through offers of IT or GCSE tuition to doing cleaning or ironing or making home made soup. 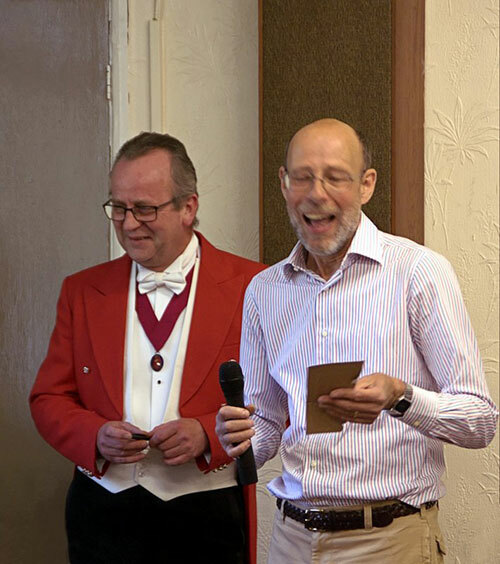 We were fortunate to have in our church community Peter Dowson who is a member of the Toastmasters Association. 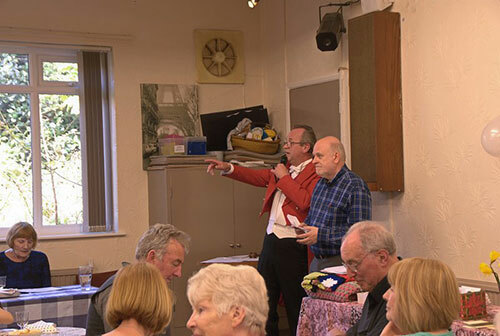 He agreed to act as Auctioneer for us and came suitably togged up in a very impressive outfit. About 60 people turned up on the day. There was a certain feverish atmosphere in the room as the auction started and when, quite early on, there was a bidding war over two hours of IT tuition (!) it became clear that this was probably going to turn out a bit differently to what we had expected. Peter was very efficient and the whole auction element was completed (all 45 promises) within 45 minutes. People were then able to relax over a cup of tea (or something stronger as the bar was open) along with a few sandwiches and cakes. Many people were unable to successfully bid for anything but the auction itself was fast-moving and entertaining in its own right. 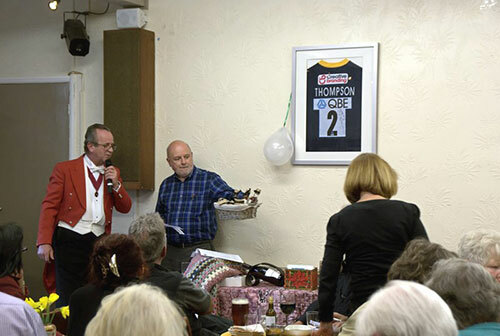 Many people remarked how much they had enjoyed the occasion and quite a few who were not able to bid successfully donated the money they would have paid for a promise. 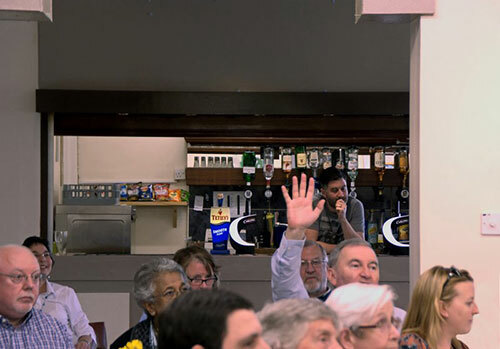 When all the successful bids were totted up, and the entry money (and donations) added in, the total for the whole event came to £2255 which was beyond the wildest expectations of anyone in the group. Our thanks go to all who supported the event in so many different ways, and this in turn reflects the commitment of everyone in the Assumption church community to the work of of Cafod and to our link with Puentecitos1.